As seemingly unstoppable UK national treasures Iron Maiden continue to go from strength to strength, so too do all-female US tribute The Iron Maidens, who are now set to embark upon their second tour of their namesake’s home country. 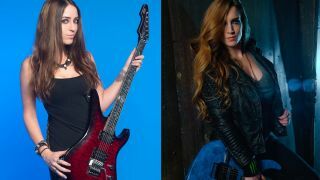 While the group ready their usual assortment of Maiden classics and deep cuts, we quizzed guitarists Courtney Cox and Nikki Stringfield - aka Adrian Smith and Davina Murray - on their favourite solos to play live. Courtney Cox: “This whole era is really what lured me to Iron Maiden when I was a young teen. The first album that I latched on to was Dance Of Death, which was the new album out when I was in high school, and all my friends played the thing until the CD got jammed, haha (I missed the ’80s as I was born in ’89 - I obviously had some catching up to do). “In my early days, I was head over heels into the thrash scene and was really into the speed, crust and thrash. That was/is the scene that had bands like Iron Maiden and other similar bands of that genre on the backburner on my Walkman (yes, a Walkman, haha). It wasn’t until I started stealing all of these older albums from my brother that I said, ‘Wait a minute, what is this! ?’ My guitar playing has never been the same since. Nikki Stringfield: “Dave's solo in Flight of Icarus is another one of my favourites! I think it was also one of the first Maiden solos I ever learned. Courtney: “This is one of those epic tunes that the girls and I love having in the set. It has that dark Egyptian harmonic minor feel to it, which is heavy and dark to perform onstage. The solo doesn’t disappoint, either. Just when you have had your fill of this one solo, there comes this other one from stage-left with a whole other twist! “This one in particular has the usual two guitar solo trade-off, which really adds the energy and levels to the song. Just when you have had your fill of this one solo, there comes this other one from stage-left with a whole other twist! “This made my list because of the first bend of the solo (3:55). The snare pop from Nikko that leads straight into the start of my solo gives me an indescribable high as a live performer. If I had to compare it to anything, I’d probably say it’s the feeling that makes you air guitar to a song, specifically a guitar solo at a show, in a car, or walking down the street, haha. Nikki: “Both of Dave Murray's solos in Powerslave have to be my favourite of his out of all Iron Maiden solos. Courtney: “A song that I’m happy to see on the setlist and one that pisses me off when I don’t see it on the setlist! From the tasty intro melody to that first C chord, which kicks the song into overdrive at 1:12, you know the solos are not going to disappoint on this track. “They start off with this killer bridge that leads you into this dual-harmony section and then bam, there goes Adrian out of the gate with the first solo, which I believe off the top of my head is in D minor. Courtney: “Other than being a marathon at 13 minutes, this song is a masterpiece. Another historical play-by-play through killer riffs and as one could only imagine in an epic Maiden tune: killer solos. “This solo is probably the only one that gives me butterflies live, and all over one section.... but we will get to that. First, we have to go over the crazy pre-solo section that forces you to have some kind of rhythm, because if you don’t, that train will be out of the gate and will leave you behind. “This is the only melody or solo part where I zone out all other instruments on stage and really focus on the connection a musician has with their instrument. I don’t hear anything except the notes coming out of my guitar. It is definitely a Zen moment for me. I love odd time signatures for this reason. Courtney: “This is my all-time favourite to play. The riff is heavy, the solo is great and I get to sing harmonies, woohoo! This solo has the same sound as the other solos I have listed, so I’m sure you can gather what my favourite playing style is by now. “I don’t have to be playing a mile a minute, making my hands do pointless stuff up and down the fretboard, or off the fretboard. I love solos that add substance and/or hold up a song. Solos that you hum to yourself throughout your days, weeks, months, even years. My philosophy with playing is that if you can sing it to yourself, you can play it. “This is another great song, with a perfect harmony section, which breaks off into another Adrian solo that keeps me on my toes as well. Some of the phrasing can be a bit tricky if you don’t do your homework on this one, specifically at 2:44. A section where if a note is missed, it can be pretty much over for you. Game over, haha. “Another cool part with this solo section is the breakdown after the first solo, which flows into this very beautiful bassline and guitar melody. It makes my hair stand up every time we play it!